Good day everyone I apologise before I begin, I know we are nearly a month and a bit away from Christmas but I couldn't resist. I got the best book ever on Saturday in O'Mahoney's bookstore down in Limerick city called the "Meringue Girls Cookbook". I love meringue its one of my favourite things to work with in the kitchen and you all know how much I love macarons. So with the girls book to hand I followed their perfect instructions and dug out some spring green colouring from Wilton, produced those babies above. I am chuffed with how they look and turned out :), I know I am going to be making so many more of these beauties in the near future. I hope you enjoy this everyone, so so so simple to make too. Pre-heat to 200c/180c fan/375F/gas mark 6. Line a roasting tray with greaseproof and fill with the caster sugar. Bake for 5 mins, baking allows for the hot caster sugar to dissolve faster in meringue later on. In a metallic bowl free from grease whisk your egg whites until stiff peaks form, starting off slowly and building up to a faster speed. 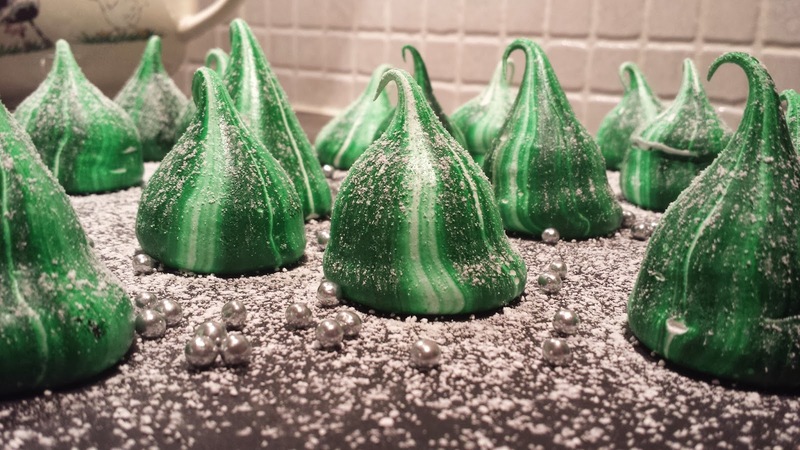 Careful not to overbeat, once you have stiff peaks and can hold the meringue over your head its ready. Remove the caster sugar from the oven, reduce oven to 100c and leave the door ajar to allow cooling to happen faster. Slowly whisk the hot caster sugar in to the egg whites a tablespoon at a time, add a few drops of peppermint extract and whisk for 5-7 minutes. After 7 minutes with your finger stick it in to the meringue to see if any sugar grains remain, if so keep whisking. With a piping bag paint the inside with food coloring and then add your meringue. Pipe the meringue on to a pre prepared baking tray. Bake at 100c/90c fan/212f/gas mark 1/4 for 35 mins. Remove from the oven and allow rest for 5 mins. Remove from the baking parchment on to a cooling rack.